Pete, Mark and some new shelves. We've got the posters done and they're up in the Comix Shoppe and a few other select places around town. So we're gonna see how much interest we get in a coupla weeks an then organise the first meeting. About time! 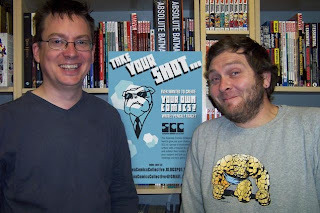 A comic collective is just what Swansea needs. Now I can procrastinate in good company. hey guys, can't wait! got a few idea's, really need a writer to help me realise them. Give me a shout if you want any help organising this I'm 100% on board and I hope we create a buzz! lets get posters in the illustration block at uni! I'm in. Dunno about times and places, but this is all quite exciting. hey dan, that blog is looking good man, some v cool pics up on there, nice job! ps, pete, that poster is humgofied!!! lol. Cheers Mark, I've started discussing my story idea on my blog now, check it out tell me what u think.